If you’ve been going into My Cat From Hell withdrawal, your wait is almost over: Jackson Galaxy returns to Animal Planet with Season 5 of his hit show this Saturday, April 26. The new season features 16 new episodes. As you can see in the photo above, Ruby is ready to watch and learn! This season, Jackson travels for the first time to Austin, San Diego and Portland, Oregon to solve a gamut of feline-related issues and repair the relationships they’re ruining. Armed with his signature guitar case and 15 years of experience helping cats, Jackson will help cat guardians find the source of the problem and restore peace and harmony. As we’ve seen in previous seasons, it’s most often the humans, and not the cats, who need Jackson’s help. Mark your calendars or set your DVR’s. 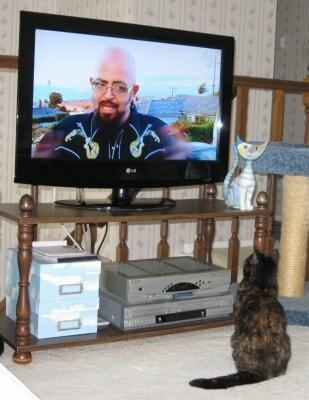 In most markets, My Cat from Hell airs at 8pm local time, but be sure to check your local listings. I love this show. Cannot wait. I love the show, and look forward to the new eps! Make sure to look out for my brief appearances during Season 5 MCFH for patients Chloe and Sweet Pea. I’ll look forward to those episodes, Patrick! So excited!! I will have a house full of feline enrichment volunteers at my house watching! I look forward to the new season. Thanks for the heads up! I wonder if it starts the same date in Sweden ? !